Fiat India said it will no longer sell its cars under the same roof as joint venture partner Tata Motors and will set up its own showrooms in around 20 cities across India in the next one-and-a-half years. Speaking to reporters here on the sidelines of the Automotive Component Manufacturers Association's (ACMA) annual summit here, Fiat India president and CEO Rajeev Kapoor said the same dealers that were engaged by the Tata-Fiat joint venture will now open separate showrooms for Tata and Fiat-brand cars. "Fiat cars will now be sold separately and independently," Kapoor said. He said in about one-and-a-half to two years' time, Fiat's independent showrooms would be present in 20 cities. "Also, we are opening two Fiat cafes, one each in Delhi and Pune, for promoting the brand by bringing 'Italian-ness'," he said. As part of a 50:50 joint venture agreement signed in 2007, the two companies had agreed to a joint distribution network and back-end support system, besides co-manufacturing of products at Fiat's Ranjangaon facility, near Pune. The relationship had come into question as Fiat cars were unable to attract sales. In an interview published in a report by market research firm JD Power, Tata Group Chief Ratan Tata had said the joint venture has not been as active as planned and the association needed to be critically examined to optimise its potential. 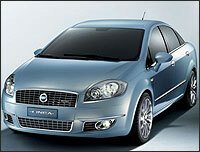 In August, just 1,069 Fiat cars were sold in the country, whereas 16,829 Tata cars were bought by consumers.